Your wedding day should be a day filled of unforgettable and perfect moments. For more than 46 years, Massanutten Resort has been a premier location for wedding ceremonies, receptions, and related events. Imagine your big day free of distractions and fully coordinated by a staff whose sole job is to cater to you. That’s the Massanutten difference. 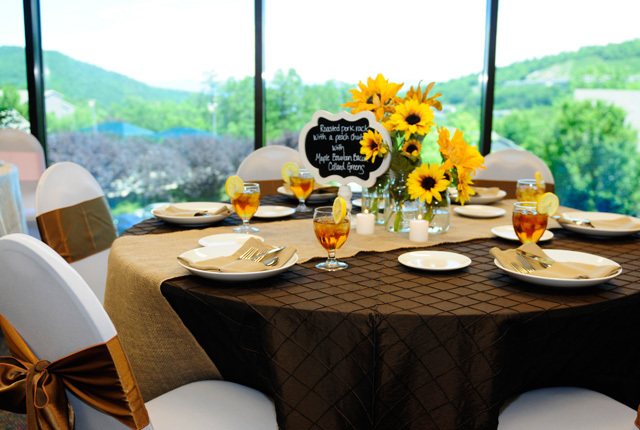 With accommodations ranging from spacious hotel rooms to luxury condominiums, indoor and outdoor wedding venues boasting panoramic views, and endless activities in all four seasons, Massanutten sets the scene for a perfect mountain wedding. Located on 6,000 gorgeous acres in the heart of the Shenandoah Valley of Virginia, Massanutten is an easy drive from Harrisonburg, Charlottesville, Richmond, and Washington, D.C. Whether you are looking to have 15 guests or 300, our staff can customize a wedding package just for you. Our menu of amenities and options for your big day includes personalized event planning services, custom menus, venue selection, group discounts for lodging and activities, and so much more. Holding both your ceremony and reception at Massanutten is a perfect opportunity to take advantage of our Bridal Suite and our Groom's Suite. A private bridal suite allows you some stress-free time with “the girls” to relax and prepare for the big day. It also doubles as a safe storage area for you and your bridesmaids—no worries about finding a place to stash your cosmetic kits, pre-wedding outfits, or styling tools! At Massanutten, our brides aren't the only ones who will be getting ready in style. Grooms deserve to be spoiled, too, and a groom's suite offers a private room for the groom, groomsmen, family, and friends. The overnight accommodations at Massanutten offer superior amenities combined with a serene atmosphere to ensure you and your guests feel right at home. Our onsite condos and hotel rooms are perfect for a bridal suite, groom’s quarters, or honeymoon suite. A true Blue Ridge experience, our mountain accommodations offer year-around breathtaking views and abundant, natural wildlife. Staying on the mountain allows you an easy drive to Campfire Grill, the Ski and Adventure Park area, Mountain Greens Golf Course, Massanutten Fitness & Rec Club, and the General Store. These charming condos are town-house style units. They feature two-bedrooms, sleeping 12, or can be locked out to two, one-bedroom units, which each sleep a maximum of 6 individuals (or 4 privately). Our newly renovated hotel rooms sleep up to 4 occupants and offer a choice of 1 king size bed with a sleep sofa or 2 queen size beds. Staying in the valley is an experience all unto itself! Enjoy scenic rolling hills, parks and pools, along with an easy drive to the Spa, Woodstone Meadows Golf Course, VA BBQ & Pizza Co., or the Indoor/Outdoor WaterPark. The one bedroom condos can sleep up to 4 people with a full or partial kitchen, and a living/dining area featuring a fireplace and a balcony. The official name for these charming condos is Casa de Campo meaning Country House. These units are two-bedroom units sleeping 8 which can be locked out to two, one-bedroom units each sleeping 4. The accommodation options listed above are best suited for larger groups. You can view all accommodation options here. After the guests are gone, continue your night of wedded bliss with an extended honeymoon stay in a Luxury One-Bedroom Suite. Rooms contain a separate master bedroom with a king bed and full bathroom complete with a large Jacuzzi tub. Honeymooners can cozy up next to the fireplace for a relaxing night in or breathe in the fresh mountain air as they watch the sunset on the patio or deck. In any season, Massanutten has endless opportunities for romance. With sunset hikes, romantic dinners, couples’ massages, and more, you’ll never want to leave! This dramatic venue offers several ceremony site options, including an outside veranda with panoramic mountain views. After your “I Do’s”, head just a few feet inside for the reception. This location is available from the first Saturday in June until the last Saturday in October. The Massanutten Conference Center is approximately 3950 square feet. The Grand Ball Room has a seating capacity of up to 240 people. The room can be divided into three separate rooms that each seat 80 people. The rooms are equipped with round banquet tables that can seat 6 - 10 guests. We have three hundred metal chairs with padded seats and backs. There is a lobby that can be used for a cocktail hour reception and is equipped with furniture. The Conference Center is also equipped for audio/visual and has three projector screens for each room. There is an in-house sound system for playing music during you reception. We also offer stage and dance floor set-up. The Veranda is perfect for wedding ceremonies as it overlooks the Kettle area of the resort. This area has also been used for seating or gathering during wedding receptions and for a cocktail hour. It is also equipped for sound. The room rental fee for the Conference Center is $1000 - $3000. The fee varies depending on season, availability, amount of guests expected, and the amount of catering that is requested. Recap the joys of your wedding day with your nearest and dearest before they leave town with brunch, which can include breakfast classics like eggs, bacon, and pancakes or classy additions like Smoked Salmon & Bagels, Omelets, and Burritos. Curb everyone’s appetites with bite-size snacks between the ceremony and reception. Savory hors d’oeuvres like Potato Cheddar Bites, Crudité, and Imported Cheese & Fruit are the perfect teasers for the forthcoming meal. Roasted or grilled and hand carved to your specifications, our chef attended carving stations are a huge hit at weddings. We can provide items such as Steamship Round, Smoked Prime Rib, Venison Leg, Ham, Hearth Roasted Turkey, or Top Round. Our highly trained, dedicated event planners provide professional and personalized attention from the moment of inquiry to the end of the event. Schedule your visit to tour Massanutten Resort today and let us help you create the wedding experience of a lifetime!